WildGame Innovations Halo Xtanium 1000 XT1000 Rangefinder Xtanium solid metal housing is extremely durable and weather resistant. Displays Reticle, low Battery Icon, Unit of Measure (Yards or Meters) and Angle. Scan Mode allows you to actively range multiple targets without having to reactivate the laser for each target. Angle Intelligence gives you the most accurate distance measurement compensated for all types of terrain, incline or decline. 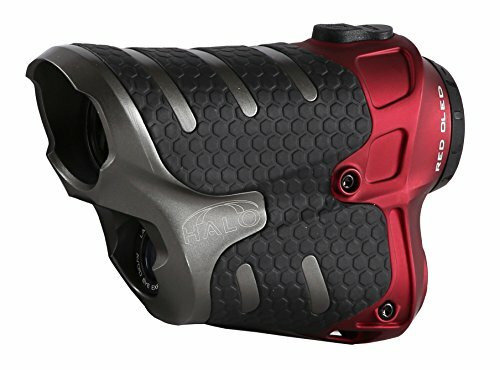 The gray Halo Xtanium 1000 8x Laser Rangefinder from Wildgame Innovations combines a laser rangefinder and inclinometer inside a water-resistant housing to deliver precise distance measurements almost anywhere that adventure leads. Angle Intelligence Technology factors in uphill or downhill slope to a target when displaying the distance, so you can make a more accurate shot. In addition to a 1000-yard range and one-yard accuracy, the rangefinder features a constant scan mode for moving or multiple targets. All measurements, mode indicators, and the aiming reticle are displayed on the rangefinder’s in-view OLED screen.